12 Days of Health at Emerson Elementary: Challenging ourselves to a healthy holiday season! This piece by Abby Temple was published on 12/30/14 on Apple Corps, the Blog. As a Nutrition Educator with Solid Ground’s Apple Corps program, Abby supports nutrition and physical activity programs at Emerson Elementary School in South Seattle. The Emerson Health and Wellness team sat in our monthly meeting, envisioning the cupcake, candy and cookie-filled weeks ahead of us. Holiday celebrations present a dilemma for a nutrition/health educator based in an elementary school – how can we encourage our students to make healthy choices while also recognizing the need for celebrations, for special treats, and for a fun ending to a difficult few months of work? How can we stray from labeling foods as “good” or “bad,” and instead, focus on moderation and “sometimes” foods? With these goals in mind, our team – composed of myself, my co-educator Ms. Paula, a second grade teacher, our PE teacher and one of our ELL (English Language Learners) teachers – came up with the idea of a “12 Days of Health” promotion for the school. For the 12 days leading up to winter break, our students were given a challenge each day over the morning announcements. 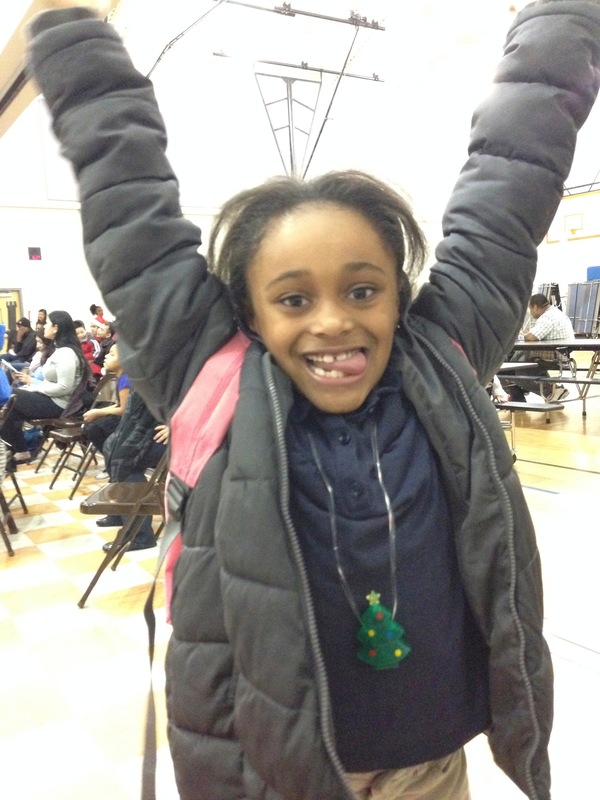 Alivia, an energetic 2nd grader at Emerson, takes the jumping jack challenge! Day 1: One special treat for working so hard! Day 3: Three laps around the black top! Day 4: Four glasses of water! Day 5: Five minutes of stretching! Day 7: Seven colors of food in your day! Day 10: Ten jumping jacks! Day 12: Twelve minutes of dancing! For 12 days, Emerson’s morning announcements were dominated by the lovely singing voices of our Emerson staff. We took turns on the announcements each day, singing the challenge to the tune of “The 12 Days of Christmas.” The kids especially loved hearing their PE teacher singing – it was quite a treat in itself. I was surprised how many students I actually saw participating in and excited about the challenges. Students stopped me in the hallway to show me their jumping jacks and lunges. I heard water described as “the most delicious drink ever!” On day 12, our health challenge culminated in a 12-minute dance party with our first graders. I may have enjoyed the dancing even more than they did. Our super healthy Emerson students are on a great track to a healthy and fun winter break! Happy winter break, Emerson! This school year, Solid Ground’s Apple Corps program will begin using the Cooking Matters for Kids curricula for students attending Concord and Emerson Elementary Schools. This nutrition education will be taught throughout the entire school year by Apple Corps AmeriCorps members serving one-year terms as well as one Solid Ground Nutrition Education Coordinator. Every classroom will receive a weekly 30- to 45-minute hands-on cooking class that promotes nutrition and culturally-relevant healthy cooking. Curriculum for Cooking Matters for Kids classes includes lessons focusing on colorful fruits and vegetables, whole grains, smart snacking and even smarter shopping. 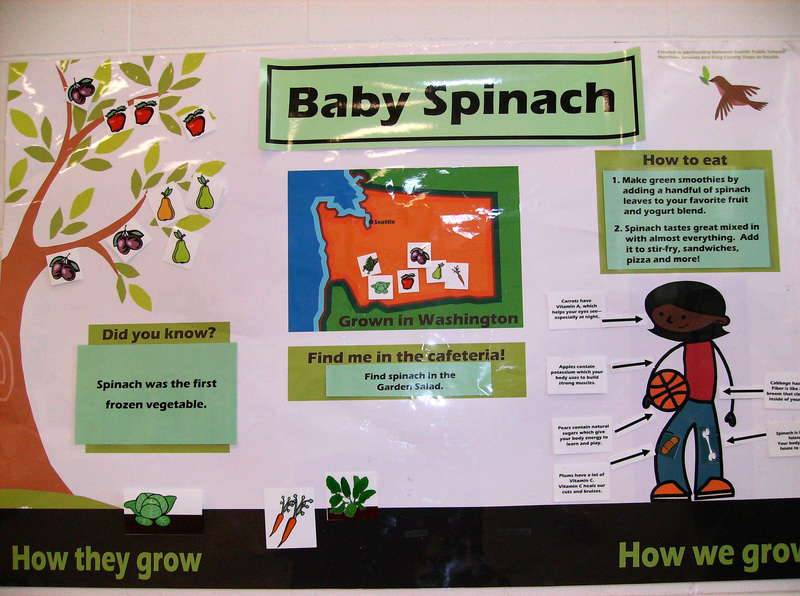 It also ties in grade-appropriate literacy and geography components of the Washington state Common Core standards to cooking. The program also seeks to serve the whole school through both classroom lessons and school-wide health promotions, such as Healthy Halloween and Healthy Heart (Valentine’s) Day. One of the first things explained in the Cooking Matters for Kids curriculum is the MyPlate diagram. The diagram emphasizes the amount of each food group you should have on your plate at meal time – from fruits, vegetables and dairy to whole grains and protein. When it comes time to choose the food to put on your plate, some of the tips that are provided in these classes are as practical as freezing bread or fruit before it spoils to use it at a later time. Another wise shopping tip for kids is that fruits and vegetables at the front of the produce section at the grocery store usually represent what is in season. More often than not, this means it is going to taste more fresh and cost less than other fruits and vegetables. For those who are not yet ingredient-savvy, “brown bread” is not always whole grain. (Anything containing enriched flour, bran or wheat germ is not considered whole grain.) Also, cereals at eye level for kids are usually the ones highest in sugar and are packaged with bright colors and cartoon characters to appeal to children. The Cooking Matters for Kids lessons take many things into account given the diverse audience that they are designed to teach. For instance, some recipes initially call for certain kitchen gadgets that may not be readily available or affordable for all households, so alternative methods of preparation are given (e.g., instead of using a blender, mash all the ingredients together with a wooden spoon). Some students and their families may have dietary restrictions (e.g., diabetes, lactose intolerance), so alternate choices are given in those instances as well. As expected, the recipes offered in the workbooks are very “kid-friendly.” If any particular step in a recipe is potentially unsafe and requires adult supervision or assistance, it is notated with a symbol (although safe knife skills are taught as well!). Ingredient substitutions for more exotic or expensive ingredients are also provided for families on a budget. Other great tips the lessons provide are ways to use up the rest of a recipe that produced a large yield. For example, if there happens to be any leftovers from the Homemade Granola recipe, suggestions for future use are to eat it like cereal, use it to top a fruit salad or mix into yogurt parfaits. Or, if there are leftover rolled oats, one could use them to make oatmeal for breakfast or oatmeal cookies. There is even a “label lingo” handout that students receive about halfway through the course to guide healthier food choices. Reading the nutritional facts and ingredients on any product is vital to ensuring that what kids put in their bodies is healthy, safe and tasty! Do you remember cooking a lot as a kid? Did you think about things like nutrition, food groups or sugar content if/when you did cook? Let us know in the comments below! Groundviews is Solid Ground’s quarterly newsletter for our friends and supporters. Below is the June 2014 Groundviews lead story; please visit our website to read the entire issue online. If you visit Lettuce Link’s Giving Garden at Marra Farm in Seattle’s South Park neighborhood on any given day from March to October, you’re likely to find a beehive of activity — often involving groups of students from Concord International School (pre-K through 5th grade), located just a few blocks away. Via collaboration with Solid Ground’s Lettuce Link and Apple Corps programs and Concord teachers, students learn about nutrition, the environment, and sustainable gardening and food systems. At the center of the buzzing, you might find Amelia Swinton, Lettuce Link Education Coordinator, who describes her job as “the meeting ground of two different education programs.” There’s gardening education through Lettuce Link, combined with nutrition education through Apple Corps. In the fall and winter, she partners with an Apple Corps AmeriCorps member to teach weekly indoor nutrition-education lessons at Concord. Then during the growing season, classes move outdoors for hands-on gardening at Marra Farm, where kids get to “Adopt-a-Plot” that they plant, nurture and harvest themselves. Best of all, they get to bring the veggies home for their families to enjoy. Since 1998, Solid Ground’s involvement as one of several stewarding organizations at Marra Farm has greatly increased access to healthy nutritious food in South Park, and one of the most effective conduits for this has been Concord students themselves. When Solid Ground launched the Apple Corps program in 2007 to do nutrition and fitness education in schools and nonprofits, Concord became a natural partner. In addition to classroom lessons, there are afterschool events designed not only to engage families, but also to encourage self-determination where healthy food choices are concerned. 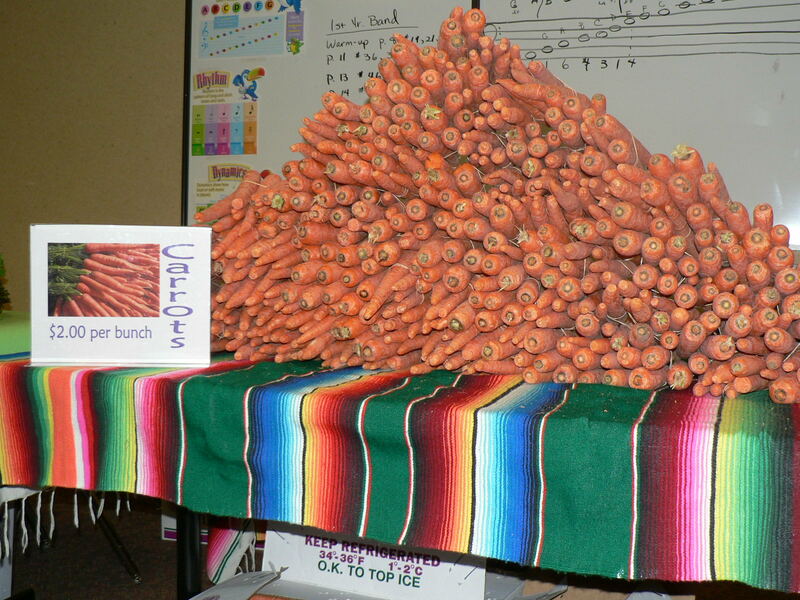 Annual “Market Night” celebrations are one such event, combining health and nutrition information and activities with cultural sharing presentations, and an open-air market where each kid is empowered to choose from and “purchase” a variety of fresh produce. Joanne definitely thinks it’s better to grow your own food rather than buy it in a grocery store because, “It’s more nutritious, because you’re proud of yourself, and you think it’s very good!” She says someday, “I’m going to go and make my own garden in the back of my house.” For now, she and her parents are happy to live so close to Marra Farm. At the end of their second class, participants and volunteers line up to share the dinner they’ve just prepared together. There aren’t many activities that can compete with sharing a home-cooked meal with family, neighbors and friends. That is until you combine it with lessons that put a smile on your child’s face and give you a repertoire of resources and know-how to keep your family healthy. Cooking Matters is a Solid Ground program offering six-week classes designed to teach healthy habits, mindful shopping, food competence and meal planning – all with a dash of fun. At the start of one recent class for Brettler Family Place residents, two families queued up outside the community kitchen bathroom to wash their hands while volunteers unpacked ingredients on the chef’s table. After washing their hands, the father and mother of one family automatically grabbed a can of beans and began reading the label and asking questions. This was only their second class, but they were already forming healthy habits. Solid Ground partners with Share Our Strength, a national organization working to end childhood hunger, which provides curricula, supplies and staff training for the program – along with tasty recipes. The simple recipes prepared during this class were nutritious, quick and packed a punch of flavor. The families and volunteers unanimously voted the appetizer – a spicy white bean dip served with pita slices – as the new football game snack favorite. One rule of the class requires each participant to taste everything once to expand food choices and sharpen palates. The families played a blind taste test game with this rule in mind. While the parents were pleasantly surprised by jicama, the kids enjoyed pomegranate and grapefruit the most – sometimes sneaking to the bowls on the back table to grab more. Volunteers provided tips on how to incorporate their favorite items in future meals and suggested alternatives if those ingredients weren’t available. Cooking Matters is funded through SNAP Ed and an annual fundraiser called Chefs Night Out. Program sponsors, Whole Foods Market and Charlie’s Produce, donate all the food for the program, so families living on a limited budget have at least one fallback meal for the week. The families were given a helping of each selection from the taste game, as well as all the ingredients for the meal they prepared for dinner to experiment with at home. Not only do families get to practice cooking the recipes, but they have the opportunity to share quality time cooking and eating as a family at home. “It’s so easy for people to connect over food and cooking,” Raquel affirmed. At the end of class, when everyone sat down to eat the meal they had prepared together, there was a sense of shared accomplishment – delight evident on everyone’s smiling faces. The class is a social event as much as a learning opportunity – a chance to escape from the stresses of life. Raquel recalls a past participant’s gratitude for the stability the class provided in her hectic life. “A mother of two kids experiencing homelessness took who knows how many buses to get to class each week. She said that every other aspect of her life was so discombobulated, and this class was the only thing that kept them together. “They needed something routine and structured,” Raquel explained, “because they didn’t have that in the rest of their lives. This mother was able to go to class with her children, which was fun and an escape from worries. At the same time she looked forward to having at least one meal at home with her family. And now she can’t keep her youngest away from vegetables. She has to constantly watch him at the farmers market because he is always trying to eat the veggies. That’s a true testament to what this class can do,” Raquel laughed. 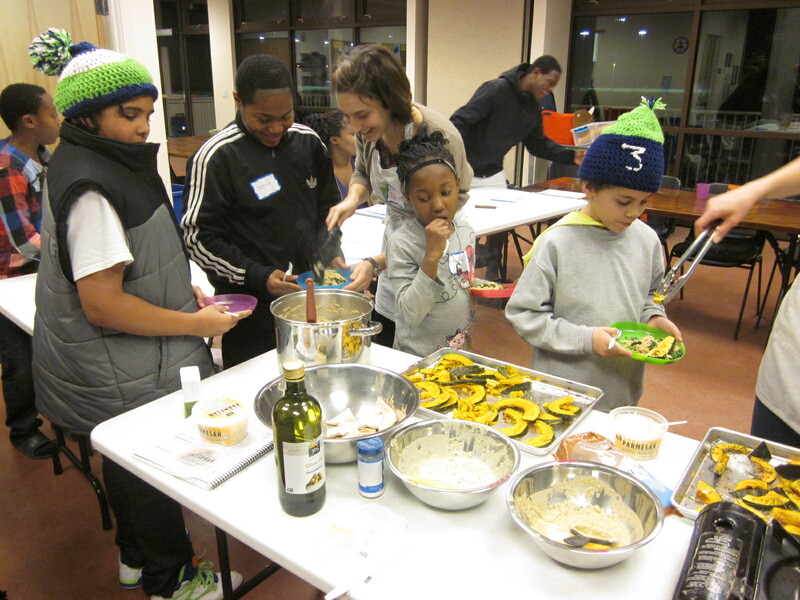 In 2013, Cooking Matters served a total of 740 participants in 58 sessions. 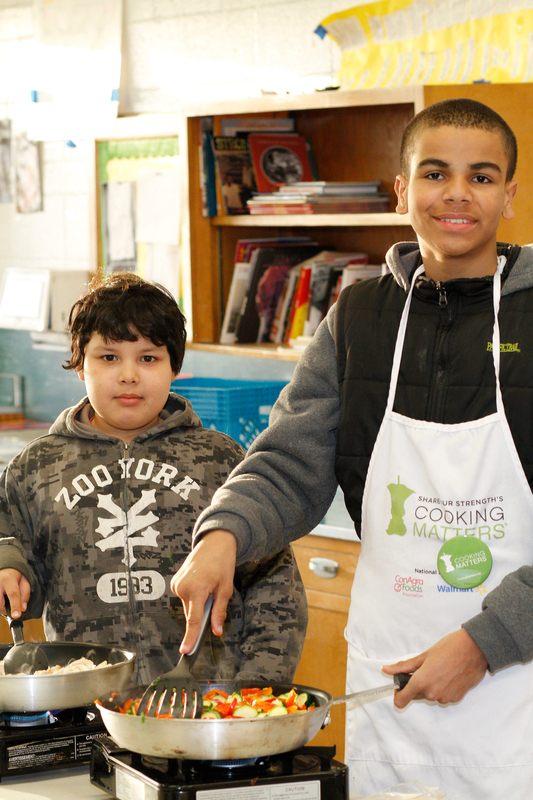 This year – Cooking Matters’ 20th anniversary – the program is reaching toward a goal of 65 six-week sessions, and expansion statewide through satellite partners. Look for the Cooking Matters app available on iTunes and Google Play. If you are interested in getting involved or would like more information, please contact Cooking Matters staff at 206.694.6846 or at cooking@solid-ground.org. Editor’s note: This report was filed by volunteer reporter Tiffiny Jaber. In the midst of the holiday season, Apple Corps’ message couldn’t be more meaningful: teaching children about healthy eating, exercise and growing food to perpetuate a positive community. 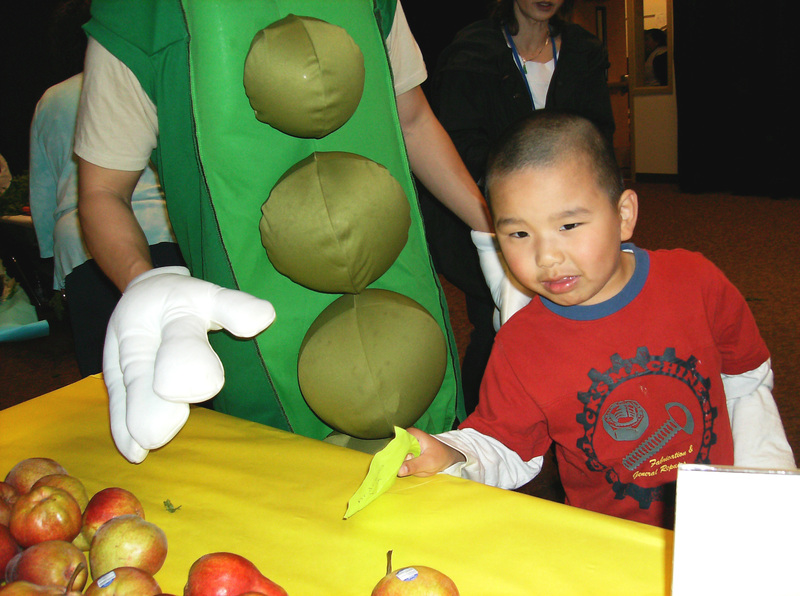 Apple Corps members – national service volunteers placed at area elementary schools – use innovative teaching techniques to get the kids to engage in these topics. Apple Corps teaches students in underserved communities how to eat healthier by showing them where fresh vegetables and fruit come from, and teaching them how to cook in delicious and nutritious ways. They get kids’ hands into the soil, teach them to value the seasons of the year, and empower them to grow food at home. Apple Corps creates hands-on experiences for kids via gardens, cooking in the classroom, and by taking kids to farms to see the land and the farmers who tend it. I recently had a chance to catch up with three of the Apple Corps nutrition educators who shared some of their experiences with me. Brian Sindel and Lisa Woo divide their time between Sand Point Elementary in Northeast Seattle and Emerson Elementary in Rainier Beach, while Kelly Shilhanek works with Concord International School in South Park. Spending four days of the week immersed at their assigned schools, Apple Corps members collaborate closely with class teachers. The curriculum is based on the Eat Better, Feel Better program, a school-based effort of Public Health-Seattle & King County that promotes positive change in how kids eat and their activity levels. Lessons span a variety of topics over 12 weeks. For example, 5th grade classes focus on healthy eating around the world; 3rd grade covers plant parts; and younger grades integrate food with literacy. Brian said the focus is on a well-balanced diet. “We work from MyPlate, which replaced the USDA’s food pyramid, and we incorporate all five food groups,” he said. The classrooms that Apple Corps members visit are treated to delicious homemade food. The members set up their mobile kitchen and provide a 45-minute cooking demonstration, which is as involved and interactive as possible for the students. Some of the food can be quite different and new to the children, so it’s not unusual for them to be apprehensive before taking the first bite. Lisa and her classes start off their snack by saying, “Bon appetit! We now may eat.” Then they each take their first “bravery bite” and talk about their likes and dislikes or show their varying approval with a thumbs up. Last year Brian led a Garden Recess Club for teacher-selected 3rd graders who needed extra engagement. Club sessions focused on different gardening lessons. 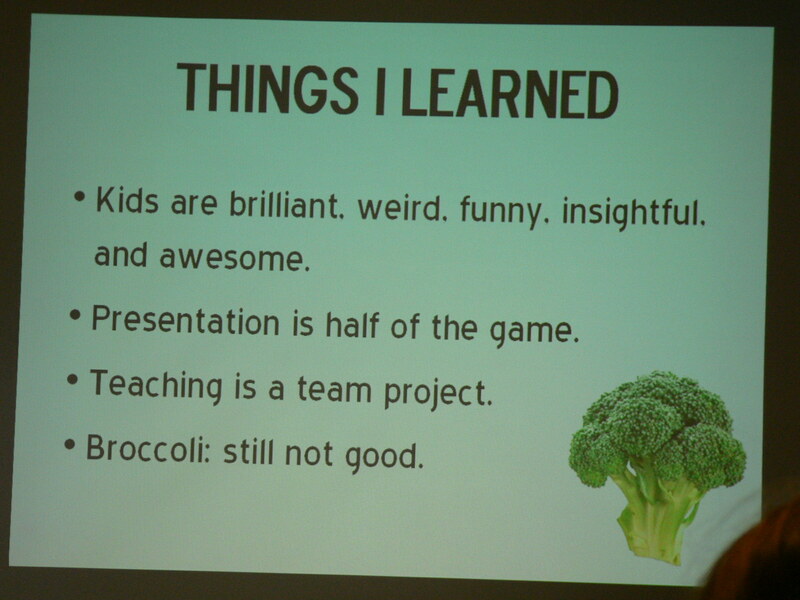 At the end of the year, Brian put the mini-lessons together into an hour-long final session that the students taught to their classes. Brian was amazed to see these students, who were usually so quiet and disengaged, have the opportunity to be the experts and leaders for the rest of their classrooms. The elementary schools each have their own vegetable garden onsite. The children also take field trips to various farms. Lisa notes, “All of (children in) the school have an opportunity to engage with farming in some capacity. … Concord students go to the Giving Garden at Marra Farm, a production farm Solid Ground’s Lettuce Link runs to support area food banks.” Emerson Elementary visits the Rainier Beach Urban Farm & Wetlands. Kelly is looking forward to spring when three of the six grades she works with have the opportunity to experience basic garden education at Marra Farm rather than in the classroom. Both Lisa Woo and Brian Sindel were awarded the title of Conservation Champions last year by the Seattle Public Schools. In addition, their respective schools received $400 to recognize their work. The money went toward greening the schools. Emerson Elementary plans to initiate a composting program with the awarded funds. Not only are the children benefiting from the Apple Corps program, so are their parents and communities. The entire school community takes part in the Farmers Market nights Apple Corps organizes for the school families. The events are free, with all of the produce donated by PCC. Concord International Elementary holds a multi-cultural night where families bring prepared food and share an amazing feast. Marra Farm hosts a Community Kitchen where farm volunteers and sometimes students set up a primitive kitchen to prepare freshly harvested organic produce for families and volunteers. Apple Corps members also rally the community together outside of their classrooms and teaching gardens. Third to 5th grade girls from Concord take part in a bi-yearly 5K run with the internationally-renowned “Girls on the Run” program. This link to the “Plant Part” Potstickers activity page and recipe gives an idea of how the children are taught about plants with a delicious recipe. You can support Apple Corps by donating through Solid Ground’s website and designating Apple Corps. If you have any questions about Apple Corps, or to see how you can get involved in this amazing program, please contact Apple Corps Supervisor Samantha Brumfield. Last week Solid Ground’s Apple Corps AmeriCorps team showcased its efforts to counter childhood obesity through nutrition and fitness education and activities. The eight Apple Corps Members each discussed their work during their one-year term to provide school and community-based nutrition and fitness education and awareness. Team Members are actively engaged in local neighborhoods hardest hit by the obesity epidemic. They teach in schools, create family community market nights, coordinate cooking classes, garden clubs and walking challenges, and use other tools and partnerships to effect change. 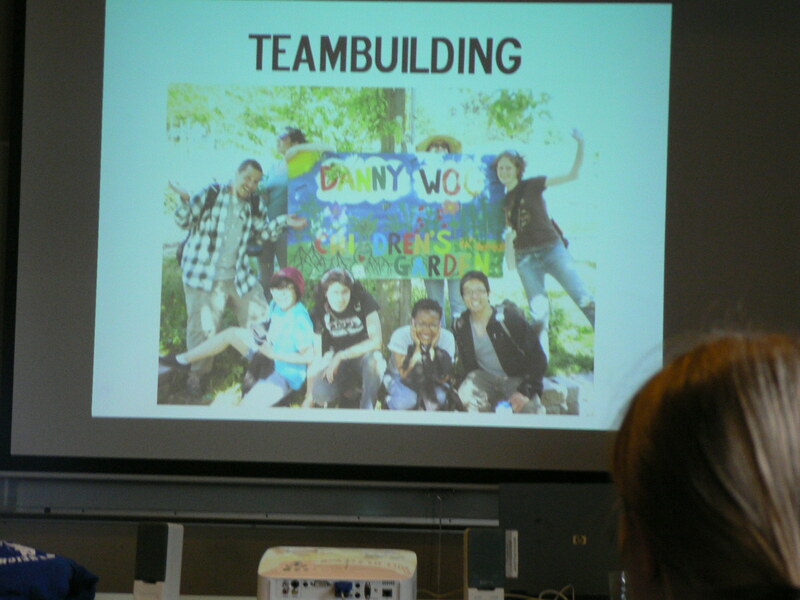 In addition to developing and providing programming, Apple Corps Members received training and support in how to manage their projects, many of which involved significant community partnerships, and applied an anti-racist analysis to their work. Apple Corps Members will wrap up their projects over the next month or so, with a new team forming at the end of the Summer! You can learn more about the Corps and donate to support it on the Apple Corps webpage.